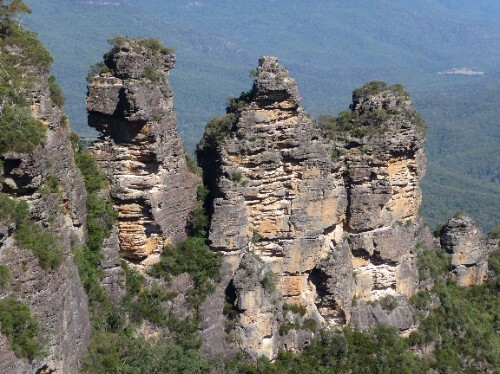 Blog from Blue Mountains, New South Wales | Helen & Andy Travel Oz! We stayed an extra day at Lane Cove to dry off and get all our clothes and annex dry before departing west to the Blue Mountains. The campsite in the main tourist area Katoomba wasn’t very nice, so snobby as we are we went to the next major town Blackheath to a nice and peaceful little site a short train journey away. 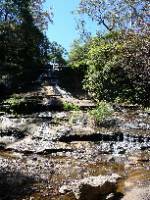 We went back to Katoomba that day to have a look around and see what our options were for seeing all the sights. We found a bus operator who circles the mountain range via all the best spots and sights, you can get on and off at any of the 29 stops and there’s another bus every half hour, plus the one ticket could be extended over several days so worked out very well for us! We took the bus without particularly getting off it so we could plan our trip the next day, and the sights were superb! So the next day we got our walking boots on and decided to do some proper trekking rather than our normal lazy effort. We walked the majority of the range in various directions, taking in waterfalls and wildlife, breathtaking views and some heart-stopping ones - literally! One of the walks takes you out to the Three Sisters, away from the cliff face, so you first have to walk down a long and near-vertical set of steps where the walkway then bridges over the canyon floor. I (Helen) didn’t quite get down all the steps, at the point where there was literally nothing below us my body stopped, so I sat on the steps in everyone’s way while Taylor managed to get across. The photos should hopefully show just how impressive the range was, but it doesn’t quite reveal the depth of the canyon and certainly not how peaceful the place is, absolutely stunning. About 80km round from Blackheath is a range of underground cave systems called Jenolan Caves. We took a day trip there and a guided tour through one of the few caves opened to the public. Taylor found the place very interesting with his love of rocks, and to be fair they light all the formations and crystals beautifully, plus it was only about 16degrees in there, heaven! The pics show the way the calcite stalactites, stalagmites and hectites form when the rain seeps through into the cave, sometimes taking more iron oxide in (the darker red patches) or sometimes clean and pure forming the sparkling crystals, and where the water was still managing to get in meant it was still growing! (That’s my simple way of putting it but feel free to ask Taylor for the boring scientific stuff!!) Ticket also included a self-guided tour of another cave with an audio phone and we went down to the blue lake which is blue from the limestone content, refracting blue light. It was beautiful and well worth the drive, although Jerry struggled up the very steep roads, bless! After our 2 busy days we travelled back to civilization towards the coast and back to a heated swimming pool and bubbling spa to recover (any excuse!) We were at a place called Parklea, close to Black town to the west of Sydney. Over the road from the site was Parklea Markets, a giant building host to hundreds of market stalls selling literally everything! There was food and drink, book stalls, massages, bouncy castles, kitchens, the full works, and very annoyingly puppies in cages! We also visited Blacktown and had a very lazy day or two before moving back to the coast.